The cover of Domestication Handbook. Photo taken by Stephanie Russo. I didn’t read Domestication Handbook. I devoured it. Or, it devoured me. Or, I stopped thinking about the distinction as I fell into author Kristen Stone’s unique way with language that begs investigation, mastication and complete, total attention. There are books you can read with one eye open, the kind that skim over your skin like a silk sheet but leave no traces afterward. The sort of books we forget, and check out of the library over and over again, because we don’t know that we’ve read it. This is not one of those books. Domestication Handbook is a sensory experience. An argument for paper if I ever felt one. Pick it up. Feel the cover: it’s soft, like the pad of an animal’s foot, the uncalloused kind. The kind that’s been petted, pumiced and cultivated into the best version of itself. So has the words it contains. These are careful structures, and I can’t help but think about fields of grain and rows of houses with side yards, the juxtaposition of farm and suburb. I think about the sameness of children and pets, about prose and poetry and the interstices between all of these. That material, and when I say material, I mean the physical matter of it as much as the content, understand, is purposeful. Masterful. There is so much honest beauty here. This introduction to the text could be an introduction to Stone’s writing style, if we see it as a methodology or as a vehicle for her thoughts, or as the arrangement of words on the page or as all of these at once. I keep thinking about this book in series, because my thoughts run as I think about it, and I think they run with me because they want me to explore more, more, more of what’s in and underneath these pages. I could think about it for days, and will, but first I have to tell you why. I had a sense as I read, that there was a method to this. Some pages are full, chock full of words in lines, the orderliness of prose structure, the page soothing in its conventional organization, because sometimes the expected comforts us. We can run through these pages like children barefoot on the lawn, our toes luxuriating in the blades soft enough for uncalloused skin. Be careful, children: there might be spiders. like plants and certain animals. which we press into the soil knowing it feeds us. The pause between ideas. The caught breath while reading. And so we go. Whimsical. “Some things I can name … Others I can’t, so they blend together.” If there is blending here, it’s purposeful. I sense everything was done for a reason, and I relish in the mystery of intention. We won’t end without thinking about memoir. We are always thinking about memoir these days, it seems. Talking about it. The accuracy. What that is, what that means, and so forth. Stone looks the problem in the face, unblinking, unflinching. Reflective without lapsing into self-indulgence, she acknowledges the problem of memoir, deftly deflecting any criticism of the form. If Stone doubts the voracity of her memory, or her telling of it, or the validity of hybrid memoir as a form or the truth of her narrative or any or none of these (because the boundaries blur, don’t they, as we ruminate on them and my colors start to run), the candid quality of her language puts to rest any uncertainty. If memoir (and there is the tinge of memoir in much of this) is often introspective and inward-focused, Stone defies those boundaries by thrusting outward with brash observations on the world within, without and in between. If you read this as a commentary on the suburban life, on farming and domestication, on environment, queer theory, the influence we have on our planet, the potential ruination our circumstances have on us as creatures and as animal beings, you will have read only a small piece of what Stone tackles in this full to overflowing narrative. If Domestication Handbook is a meal, it is meaty, chewy, umami with the sort of substance that comes in deceptively small portions. It looks slim, bookshelf-browser. Beautifully, if sparsely, plated. (Request a to-go box). If you feel nothing while reading Domestication Handbook, you are dead. Or worse, you are hardened against the power of words in the right hands. “If I couldn’t be warm I wanted poetry.” There is blood in these words, and sinews. There is flesh and bone and pulsating, breathing worth that we would all do well to swallow. No sterile, gleaming, scrubbed-shiny words here. This is grit and grime. It’s not always pretty. It’s not always perfect. You might not ‘get’ it on the first try. And that’s part of the journey. Get into Domestication Handbook. Get it under your fingernails. And close the back cover with that ache in your bones that becomes the warmth of a body that has labored long and well. These words will live inside your spine. Count on it. 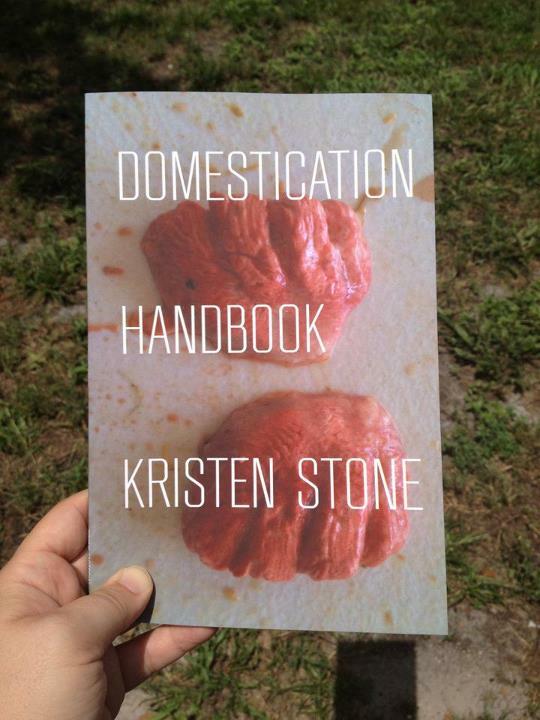 Domestication Handbook is available, among other places, from Amazon.com and Barnes & Noble.